There’s a famous technique in postmodern literature referred to colloquially as “The Quaker Oats Box” effect. If you’ve looked at the original picture on such a box you may already understand the reference: in this picture, there’re a couple of kids pouring cereal out of a Quaker Oats Box. In order to make the effect complete, on the box in the picture is the same picture we’re looking at: two kids pouring oats out of another, smaller Quaker Oats Box. And if you look closely enough, yes, yet again, another picture appears on that tiny box of two more kids pouring out oats from yet another, even tinier box that one presumes has a picture…and so on and so on, ad infinitum. For the artist, this reference refers to the “story inside a story, inside a story,” technique, and such is the technique at the heart of Charlie Kaufman’s Synecdoche, New York, a convoluted yet intriguing tale of an artist who contemplates his own life in such self-referential detail. Fortunately, this isn’t the only technique Kaufman employs: he also wishes to create the effect of life speeding by, and so the story of the life of the film’s main character begins to pick up a dream-like momentum as the story progresses: time passes faster, smaller details drop away, major life events take on symbolic significance. All much as it is in life, itself, which is what makes Kaufman’s film so engrossing, and perhaps his best effort to date. Caden Cotard, played by the always amazing Philip Seymour Hoffman, is our artist: a playwright whose wife and daughter leave him just as he is achieving his first real creative and critical success. The pain of separation, combined with the freedom delivered by a government grant, allows Caden to begin his greatest and most comprehensive work: a play large as life about life itself. For such a theme, Caden needs to rent out an entire warehouse, in which he constructs a replica of his own life, hiring actors to play the people who populate his real existence (including Tom Noonan as actor Sammy Barnathan playing Caden with brilliant understatement). Naturally, as those actors act out the trajectory of Caden’s life, they come to a point where they must create their own masterwork – a box inside the box – and hire their own actors to portray the artist, and so on, and so on, all while Caden continues to direct the entire affair (or, perhaps, be directed by it), to the point where we know not, any more, where one level of reality ends and another begins. Kaufman is no stranger to postmodern indulgences in his work. He took the movie world by storm with his quirky and odd Being John Malkovich, in which he explored celebrity as a kind of purchased identity that one might try on for a while, much as a puppet master would try on the identity of a new puppet (or an artist his character). The story was odd but amusing, and put Kaufmann on the map. His next works – Adaptation and Eternal Sunshine of The Spotless Mind similarly explored postmodern conflations of reality, between books and real life and real life and memory, in each case…but those works lacked the freshness and audacity of Malkovich and seemed to deliver little fresh insight from the artificial techniques. Now, with Synecdoche, Kaufman has entered a new territory. The work now lacks all conventional cinematic entertainment – the characters are difficult and self-involved, yet neither famous (as in Malkovich) nor zany (as in his other films) and thus, this new piece has found little popular audience (it’s no coincidence, really, that Caden’s wife, played by the always entertaining Catherine Keener, is named Adele “Lack”). And yet, for the first time, Kaufmann’s rather juvenile sense of postmodernism (and the self-reflections of artistic creation that many high-school writing class students love to indulge in) have finally matured. Here, Kaufman is finally taking on the larger themes of life, love, loss, and death that is typically at the heart of great postmodernist literature. It’s hard to know how much of this is due to Hoffman’s assistance, for the actor knows what Kaufmann is going for and brings unprecedented depth of feeling to the role of a Kaufman protagonist. As his life progresses and his work takes on new levels of self-referential complexity, the cadence of Caden begins to propel along with poetic harmony, and Caden learns about himself in ways that no other Kaufmann character has. Unlike previous stories, Caden enters relationships, has complex feelings for women, and finds his fictional counterpart executing different turns and thus different outcomes that illuminate the decisions that each has made. The counterpoint between Caden’s huge, all-encompassing warehouse of art and his Adele’s tiny, postage-stamp-sized miniatures is particularly exquisite, and underscores how each artist’s pursuit of truth is not only different, but at times can be completely in opposition. As Caden’s play nears its final act, just like Shakespeare or any artist working at the top of his game, Caden begins to truly innovate, and as his “unconventional casting” takes over the story, we start to see how life and art are both circumscribed by the limits of time and human frailty. This is not the only artist couple we’ve seen in Kaufman’s work, or the only contemplation of the artist’s life, and there is definitely an academic dryness to the life of two artists whose fights over artistic technique stand in for couple-things as wide ranging as child-rearing and love. But this time such insularity is used in service of Kaufman’s theme, for Synecdoche is ultimately about the value of an artist’s life, and whether any artist’s attempt at creation and understanding can assuage the ultimate reality of age, loss, and death. 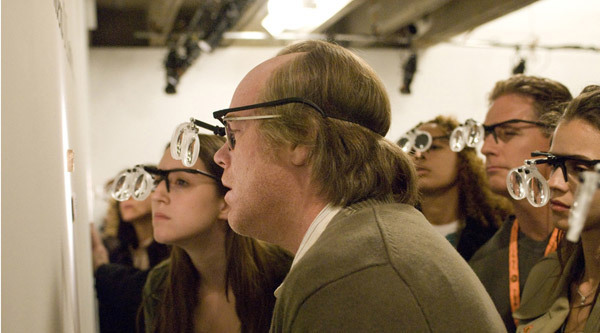 Synecdoche is a very good, not great, work. The first act drags, there are flaws in how Kaufmann approaches his technique, and he doesn’t always manage the pacing with reality or the explanations with the audience as well as he might. But there are wonderful moments: the symbolism of a house on fire, a tattooed child, or a street map of Caden’s living play, all used to marvelous effect. Behind it all, we finally see what Kaufman has likely imagined himself to have all along: the talent of a great artist. With it Kaufman finally enters territory once explored by filmmakers like Kubrick, Kurosowa, and Tarkofsky. This film deserves more attention than it’s gotten, and finally establishes Kaufman a director who deserves to be watched closely, as someone who has the potential to enter the pantheon of the world’s great film artists. Maybe the WORST movie I've EVER seen. Can I give it zero stars? I wanted to like this movie. Really, I did. The cast is first rate and it started out interestingly enough. But the movie decends into a muddled, meandering mess. And talk about depressing! The story within a story within a story is worthy of exploration but the use of symbolism and allegory to such an extreme, combined with the fact that the story (if you want to call it that) is VERY depressing and ultimately fruitless ---- well, I really wish I had that 2 plus hours back in my life. What a compete, utter, total waste of time. The fact that I'm even thinking about it now angers me but I figured if I can spare others from my misfortune, maybe some good has come out of it. How this movie even got made is a mystery for the ages. Really horrific. You've been warned!